It’s Memorial Day weekend, a weekend all about remembrances and parades. It’s a weekend to remember the heros. From now on, I’ll be remembering a different sort of hero. Our lovely dog Dylan, who had a life filled with love. He spent Saturday morning chasing chipmunks, around 7pm began to act strange, jumped up in bed with us when we went to sleep, then jumped down at 3am and collapsed after taking just two steps. We rushed him to Friendship Animal Hospital. Dr. Bier was kind, straightforward and empathic when she told us he had muffled heart sounds and a lot of fluid of unknown type around his heart. As we considered surgical intervention and whether we should put Dylan through anything like that, the doctor came back out to the waiting room and said she thought he was trying to die. We rushed to him, held him and felt his life end just twenty minutes after we first walked through the door. It’s been pretty sad around the Barrow household. Both of us are traumatized, but we can feel the pain and shock lifting, and we remind eachother how much love he gave, and how much we loved him. We’ll bring another dog home one of these days. 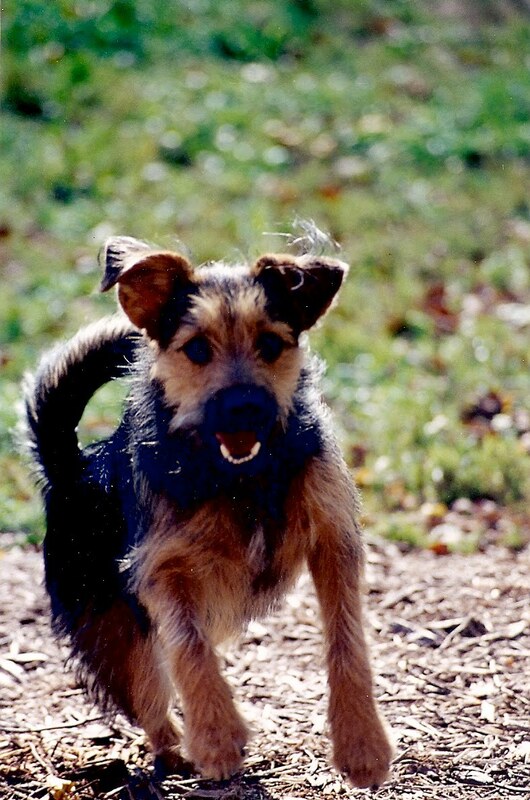 It will be another scruffy terrier mix, because we like ’em. The dog won’t be Dylan, we realize that, but that next dog will have the same Dog’s Life this sweet little fellow had. Thanks go out to all of you who have left messages, called and written to express your sympathy. Dylan touched so many people in so many ways and the outpouring of love has been amazing. And, especially, Portia Wood and her two dog loving children, Jack and Violet, and her dogs through the years – Goldie, Holly, Jones, Henry and Mystic. A place where Dylan always felt safe. This is a lovely tribute to your beloved family member. I'm in tears. We are just gutted for you all. I remember so well the aftershocks of our own sudden loss, and I was crying today as I followed your photo uploads of your sweet Dylan on flickr. He was a beautiful dog, a delightful spirit, and I am so, so sad that I won't get the opportunity to meet him next month as we had planned. Mostly, my heart is with you in your mourning, the difficult adjustment as you get used to that little furry presence not being where you expect him to be. We have many, many in-person hugs for you soon, but until then, know you are in our hearts, and we send hugs across the miles. I am sorry for your loss but take comfort in knowing Dylan couldn't have been more loved in his life! This is such a lovely tribute to your boy. I am so sorry. Losing dog friends is just the worst thing. Love and prayers to you and your family. I am so, so sorry. What a beautiful tribute to a one-of-a-kind friend. What an adorable boy- I am so sorry you lost him so suddenly Cathy. I know you will miss him terribly, especially at first, but in time you will honor his memory by loving another sweet and scruffy terrier. I send big hugs to you and Dennis. Hearts are breaking in Arizona…so sorry for your loss, and what a loving tribute you composed. Bless little Dylan…and you, too. I am so, so sorry for you. We just adopted a dog and he has been such a blessing for our family. I know how hard it will be when that inevitable day arrives. Thank you for sharing Dylan with us. So very sorry for your loss, Mrs. W. Take comfort in knowing that so many of us are celebrating Dylan’s life through your kind words and photos. As a fellow dog lover, I empathize; it's so hard to say goodbye to such faithful, funny, loving friends! Peace & hugs to you. Sending good thoughts and best wishes. Beautiful Flickr photos and tribute — he reminds me of our little Nutleigh, who I will hug extra hard when I get home tonight. I know it takes time to heal, but please send news of the new pup upon arrival! i'm so sorry for your loss. we lost our dog, a standard poodle, in a similar unexpected fashion when she was 12 – we just weren't prepared. that was six years ago and i just found one of her toys two weeks ago. it made me very sad at first, but then i realized how happy i was to remember her playing with it. i hope that as time goes by, it gets easier and that soon, you'll be able to have the same reaction to seeing something of Dylan's. Oh, Cathy. I am so very sorry. And sad. Dylan sounds like the very best of furry family members and I am devastated to know he is gone. Please know that my thoughts are with you and your husband. As I was browsing the internet I came across your site.. I started to read and the tears began to flow..I looked down at my Lucky and can’t even imagine my life without him. Every now and then I see him struggling up the stairs and once in a while I see him fall when he is outside and struggles to get up..Bad thoughts always go through my head..
I’m so glad your healing..and I’m so sorry to hear about your loss..
Oh Cathy, I didn’t know you when you lost your sweet boy. What a lovely, heart-breaking post.